The wonderful man in this image is my former insurance agent. He's recently retired but has seen my family through our business needs, personal needs, and a catastrophic house fire. His wife died about two years ago. 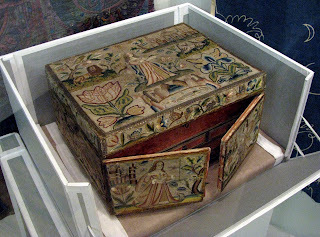 The stitched background reads: In Sickness and In Health 'Til Death Do Us Part. Lots of people make these vows; lots of people keep them; but it is an important decision...especially under trying circumstances. Title: Overcoming Domestic Abuse. Stitched words: I pressed charges. Title: Somebody Else's Miracle. Stitched words: I gave up a child for adoption. Title: DUI. Stitched words: I made a mistake. Title: Kidney Donor. 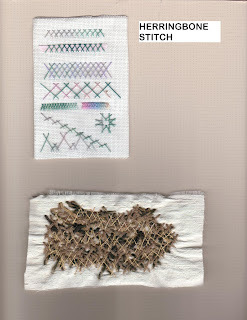 Stitched words: I had two...but to share. Title: Tattoo Artist. Stitched words: Marked for life. Title: Athetist. Stitched words: There is no God. Title: Death Wish. Stitched words: I attempted suicide. Title: Shoplifter. Stitched words: It wasn't mine. Title: Nun. 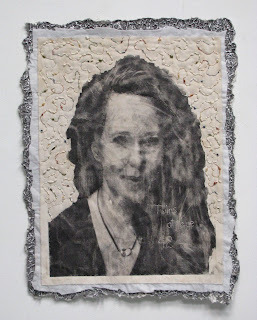 Stitched words: Married to Christ. Title: Prostitute. Stitched words: By the hour. Title: 911 Operator. Stitched words: 24/7. 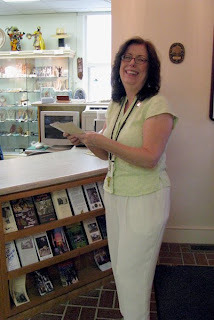 Another upstate news publication had this to say about the exhibitions in Pickens! 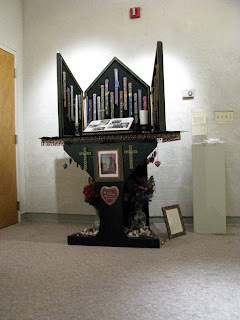 Matt Wake, a writer for Upstate Today, a news publication serving the Clemson/Greenville area of the northern South Carolina, wrote a review called "Triple Feature" that includes positive feedback on "Blues Chapel"! 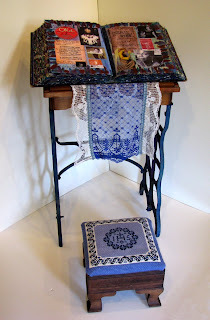 I'm not going to post the entire thing here because I just put it on the blog for Gallery 80808....but I'm thrilled! Yesterday was a wonderful day despite the fact that I turned 49! I'm claiming 50 though....taking a year to get use to the new decade! 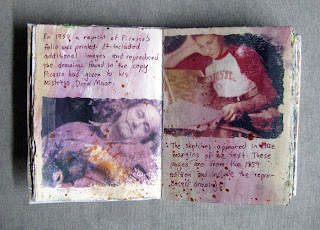 I also finished, photographed, and created a video of my newest artist book. It was started months ago...the result of an inspiration brought on by my cyber friend Doreen's once piece of lost fabric. It inspired a book cover. At first I created all these wonderful pages for the new cover. 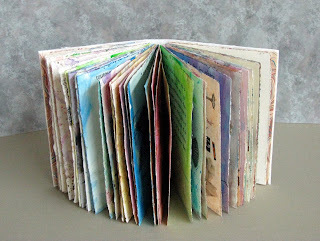 Then, I hated the pages with the cover and set them aside. I created my Mask Book for the cover. 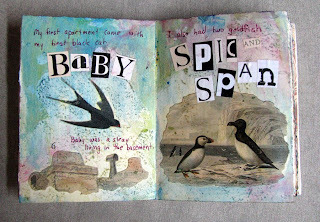 It's been in a juried show and won an award...but I still had the pages. They were created out of very special paper, the printed pages of a 1959 French publication with Picasso illustrations and sketches...all for a modern edition of the mid-18th c. naturalist, Georges Buffon's Histoire Naturelle. A framing client/book dealer had me dismantle the volume and mat and shrink wrap the images for resale. He said I could keep the rest...the few pages of text...enlarged reproductions of Picasso's handwriting with a few drawings. 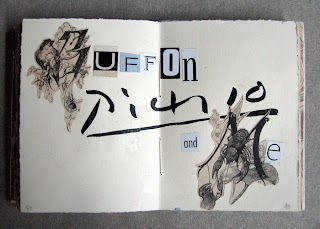 I finally decided how to use these pages and created Buffon, Picasso, and Me. All the engravings come from various volumes of Buffon's editions printed in 1819 and 1827. We deal in antique prints afterall! All the pages are made from the 1959 text. I added transferred images of our pets and my own family memories. I created a set on Flickr! where all the words are legible...even as a slideshow. It can also be viewed on "My Video" blog....complete with Camille Saint-Saens' Carnival of the Animal excerpts as background music. I'm trying to really document this little book because I've got a potential client....the CYBER FYBER caterer....a possible trade: part of the reception for the artist book! I also finished my TAST detached chain stitch. I had an early afternoon meeting at the South Carolina Arts Commission too....pitching CYBER FYBER. I've already blogged about this wonderful experience on the CYBER FYBER journal. 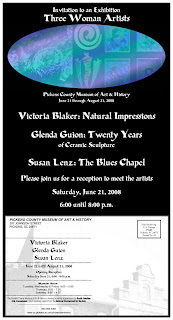 Last night was the opening of Blues Chapel at the Pickens County Museum of Art and History. It was wonderful. Everyone seemed to enjoy it. Ellen Kochansky even came. 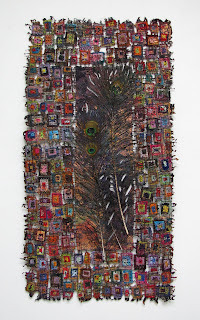 I'd never met this incredible fiber artist....but I sure knew her name! She liked my installation too. I'm totally honored. Yesterday I finished Standing Up for Peace, the newest piece in my "Decision Portraits" series. 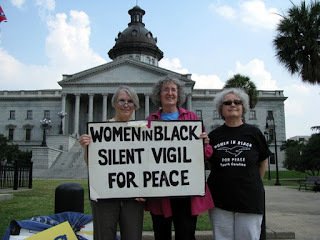 I intended to embroider the words "Standing in Silence" and call it Women in Black; but, their sign was perfect. I didn't intend to use buttons and thought the work was done several days ago; but, I accidentally dribbled fuchsia ink on it. Discharge paste almost "fixed" it. The buttons worked and I like it even better. I even used my TAST stitch, the buttonhole around the aluminum washers! TAST is already making me think about how I use "stitch"...opening my eyes to new possibilities! Here's my buttonhole stitch. As I've admitted before, I usually use the same six stitches for everything. Buttonhole isn't one of them...but it is on the list of stitches I know and sometimes use. (Short list of about 20!) Generally, I do a buttonhole stitch around a bunch of threads that I've coiled around an object. To the best of my knowledge, this is called the Hedebo stitch...but it's really just a buttonhole stitch. I've created my Geode series using this stitch. Below is a detail on Geode II. I have yarn coiled around every paint container, can, jar, and any other round object in my studio when I work on one of these Geodes...and button hole all day long! Friday the 13th...a GREAT Day! Steve and I picked up the cute little rental truck on Thursday. It really is "little" when compared to the twenty-six footers and the tandem axle tractor trailers that were also on the lot. 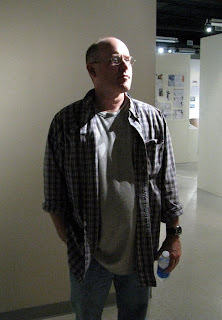 We drove to Edgefield and attended the very, very nice closing reception for "Blues Chapel". It was the first time I was ever interviewed by a newspaper reporter...and it happened TWICE...two different publications in the area! Early the next morning we dismantled "Blues Chapel". 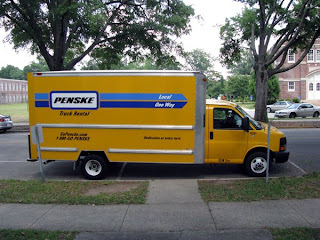 Our rental truck looked like the photo below. We drove to Pickens. Rarely have I been treated as wonderfully. The entire staff helped unload....from Allen Coleman (directly below), the executive director to every other available staff person! Steve and I excepted to unload, move into the room, and install everything ourselves. It would have taken hours of back breaking work. We were ready....but...what happened was quite different. The bulk of the unloading and moving was a group effort. Dan (pictured below) made everything so much easier...especially since he's actually going to be the one hanging everything! All I had to do was lean things against the walls on which I wanted them...talk about how I wanted it to look...not even worry about the signs or tags or lighting. The church pew wouldn't fit into the elevator or easily get up the narrow staircase....so Dan unscrewed it...we carried it...and Dan assembled it again. He's a real gem...and amazingly he's from Ohio (just like me) and graduated from Slippery Rock University (the college where my Dad taught until retirement...in the town in which my parents and two of my sisters now live...and my mother had been its mayor when Dad was in school there!) It is a small world. Steve and I left the Sealevel Gallery looking like these photos. We had time for a relaxed, late lunch before our drive back to Columbia. I can't wait to return for the opening next Saturday night...it will be an "unveiling" even for me! Having a baby after one is forty is often impossible. As far as I'm concerned, having twins at age 42 is totally unthinkable...but it was exactly the decision made by my friend Britta, another talented fiber artist who also paints and creates incredible porcelain figures. (She is included in Pluckfluff's new publication, Intertwined.) Britta kindly sent a great photo for me to use in order to achieve this new piece in my current "Decision Portraits" series. Today is also a BIG DAY. 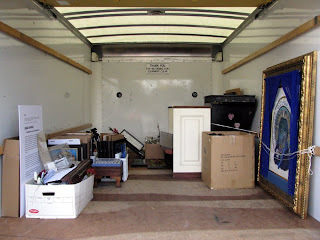 Steve and I have already picked up the twelve foot Penske rental truck and loaded it with the additional art for Blues Chapel in Pickens. 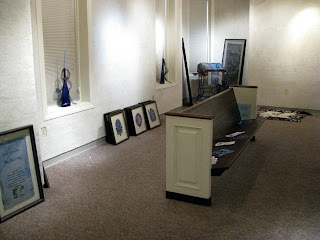 We leave later this afternoon for the closing reception of Blues Chapel in Edgefield. Tomorrow's plan: Dismantle, load, drive, unload, install, drive home exhausted! I can't believe it! Steve and I are going TOGETHER to England AGAIN...in July (8-14)! We are going to see Mathias who has been cast in Giselle (likely my favorite classical ballet) in the role of Peasant Pas (a major part in Act I). So....if anyone knows of a great "fiber" destination, please let me know. Steve and I are also planning a day trip to Buxton. 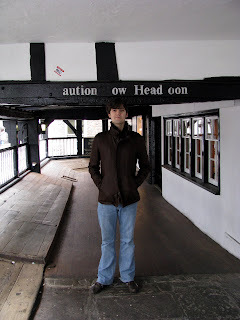 Of course, I hadn't finished posting about my last trip to England. Yesterday, I caught up...sort of! 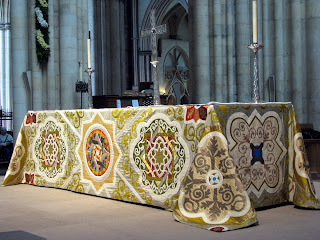 I created new sets of images on Flickr for York (mostly architecture and stained glass), York Cathedral (Interior shots only...including some wonderful images of liturgical textiles), Chester (including photos of Mathias), and the textiles at the Whitworth Gallery in Manchester. There are explanations on these images. Thus, I'm considering this "caught up"! TAST (Take a Stitch Tuesday). Week One. 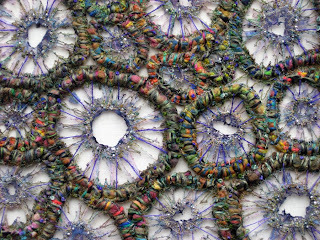 Last year stitchers all over the world created thousands of fantastic works as part of the TAST challenge. Emmy is creating a one-of-a-kind book that will be part of CYBER FYBER next January. I, however, am making a notebook...a functional (as opposed to "beautiful"!) working tool to which I might refer later. So, here's week one: Herringbone Stitch, counted above how I'd probably use it below. Hallelujah! The kneeler is done! Just in time too! 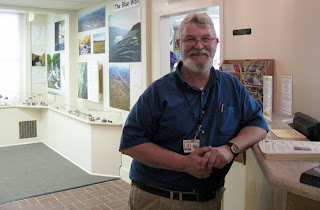 This coming Thursday we pick up a 12' long rental truck to haul everything already at the Region 2 Discovery Center plus all the additional art still here. 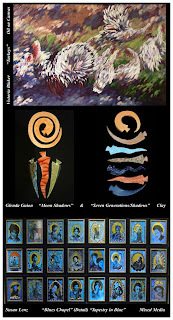 Thursday night is a closing reception for "Blues Chapel" in Edgefield. 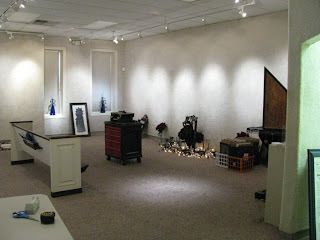 We dismantle the exhibit Friday morning and drive for the bigger installation in Pickens that afternoon. I think I'm ready! Stitching the kneeler made me realize that I don't know many stitches...probably about twenty. Of these, I generally use only six: straight stitch, back stitch, couching, French knots, and an occasional cross stitch and chain stitch. 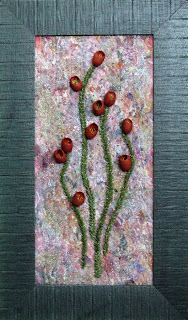 So...I've taken up the challenge....TAST (Take a Stitch Tuesday) on the stitchin fingers forum. This week HERRINGBONE! CYBER FYBER uptake: I spent almost all day Friday using the wonderful new stitchin fingers forum to contact fiber arts in countries and US state with whom I haven't yet traded. I've traded or am in the process of trading in several new countries....I only need the following states: Delaware, DC, Hawaii, Iowa, North and South Dakota, Vermont, and West Virginia...some of these already have possibilities too! If anyone reading this comes from one of these states or knows a stitcher in one, PLEASE PARTICIPATE! Thanks! Three projects...three different ways to work! Every evening I've been forcing myself to do traditional needlepoint. The kneeler for Blues Bible is almost finished. I'm determined to finish it tonight. I hate it...but I want it...so I'm stitching it. It is "project # 1". The work is slow, boring, and being utterly FORCED. It was necessary, however, to do something FUN! Flora was exactly what I needed; a break...a little diversion in order that I could continue the kneeler. I made Flora to fit the green frame that was already made from leftover moulding. 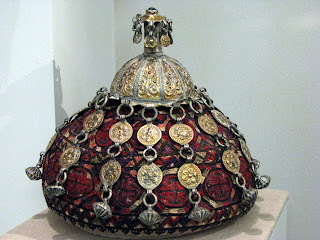 There's little crystals and seed beads inside each silk pod. It was "project # 2". The work was fast, fun, just a wonderful whimsy of play. I've also been busy working on "project # 3", my Decision Portraits series. There will be lots of paperwork, emails, telephone calls, and in-depth conversations in order to line up the people whose images I want to use. This is "project # 3". The work is serious, long-term, and feels like an incredible journey already. This week I shot my insurance agent....with my camera! 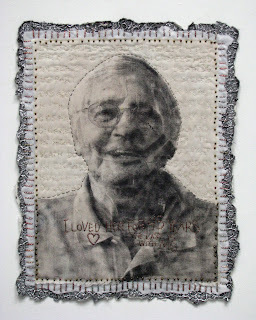 His portrait will include stitched words: I Loved Her For 45 Years...The Last 15 With MS. The title will be: Husband. 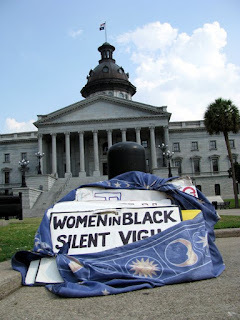 Yesterday I also went to the South Carolina State House. I'd arranged to meet three ladies right before 5:00. From 5 - 6 every Wednesday for the past five years or so, a group of individuals stands in silent protest. They are WOMEN IN BLACK. 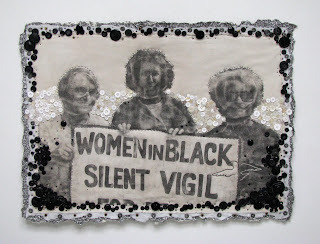 The stitched words will read: Standing in Silent Protest. The Title: Women in Black. Some of the participants weren't wearing black this week. It was 100 degrees (that's 38 Celsius). Black just isn't a color for that sort of heat. I don't know how they do it. I was sweating from the moment I got out of my car. Standing there, week after week, is a real commitment...a personal decision. Please know, however, I'm also working on getting an image for Patriot. This project is not a religious, social, or political statement...it is about DECISIONS...any decision; good or bad; right or wrong; no value judgments attached...just a way to reflect on the choices we all make in life. From the State House, I met Steve at the Liberty Tap Room. We were there for a charity event. Steve and I attend many such evenings for lots of good causes. I don't always blog about them...but, this one got me thinking about the different ways in which we work. 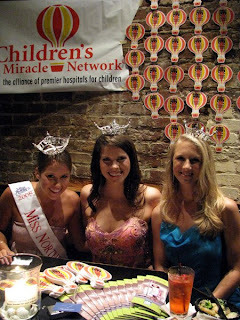 The event benefited two organizations: Children's Miracle Network and Project Pets. Two different groups working together in a totally different setting. (Most charity auctions/fund raisers around here are held in rental halls, large private homes, etc....not in restaurants generally open to the public.) The food was incredible. 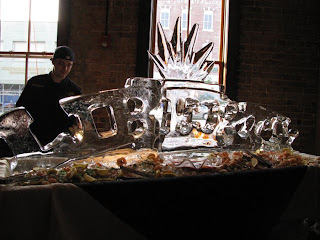 I adored the ice sculpture. The crowd was great. There was a live band on the patio, raffle tickets, a silent auction, and more. They gave us T-shirts too. I'm sure lots of money was raised. It was nice to see a fund-raiser working in a new way. Mathias is mentioned in DANCE EUROPE Magazine! If you want to read about Mathias, here click here! Steve and I are thrilled....and we're going to go to England again...in July...to see him in Giselle and another Stravinsky triple bill! Over the weekend I finished the second piece in my new series inspired by Decisions, a recent installation. Because I don't really draw, I've never even thought about a self-portrait. Most artists I know have created at least one. Historically, self portraits have been used to study the inner soul of their makers. Self portraits are markers of the artist's development and signs of the time. They are often viewed as signatures left by an artist for posterity. Wow! That's a lot to live up to...a lot to think about. Approaching this piece, my first self portrait, I had to decide how I'd like to stitch it. I got nervous, but the answer came to me as if on the wings of serendipity. An email from my good blogging friend Doreen G mentioned buttons...using buttons to sew together a quilt. 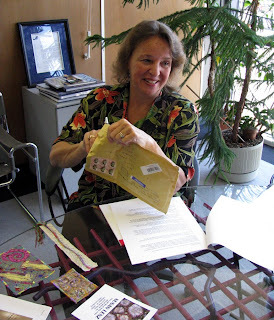 The sentence wasn't a suggestion; Doreen knew nothing of my project at the time; but, the suddenly I had a vision and the project just came together from that point on. I truly like my self-portrait which is something I didn't think I'd be saying at the onset. Generally, I dislike images of me. Business was still growing. Many employees were truly nightmares. I had stopped sleeping, hated life, and was miserable. Finally, I had to admit to myself that I wanted to make art. 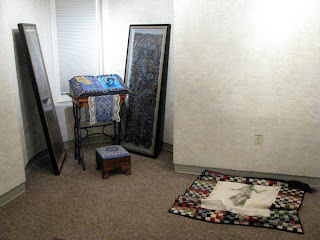 Without training or experience, I finally fired my head mat cutter (for more reasons than are worth listing) and started a two year process to downsize Mouse House, my business. Steve and I helped other employees get new jobs. Now, the business is just Steve and me....happiness. We still frame on a very limited basis...for people who trust me to make all the decisions in their absence! We are picky as to who we accept as clients. So, in a sense, I'm still a picture framer....but I did QUIT....I quit being the head designer who met with people all day, every day. I quit being the manager. I quit running the business. I quit how I spent all my time...in order to become an artist. It's been a wild ride. 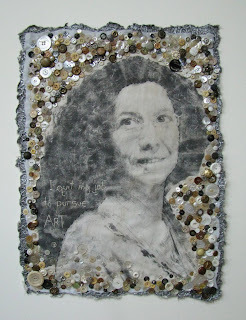 I don't know if all this is reflected in my portrait...but the buttons are both new and old...and I'm smiling! Also this weekend, I finished a new piece in my "In Box" series. I added peacock feathers at the suggestion of a potential client who is looking for a commission. I couldn't accept the commission immediately because I'd never tried adding peacock feathers in this manner. If the client likes it, there will be two more. If the client doesn't like it, there's still this piece! I'd call that a WIN-WIN situation.